TUMEKE! : Does this man know no shame? Does this man know no shame? Well obviously Wolfowitz doesn’t, I mean apart from the fact he runs an organization set up to create even more power for Western corporations who force trade arrangements on poorer countries which in turn get flooded by mass subsidized product from the West, which in turn makes the poorer country even more of a basket case. Apart from what Wolfy did as a warmonger at the Pentagon, apart from supposedly being anti-corruption yet appointing his girlfriend to a position – APART FROM ALL THAT - the guy doesn’t take the only honourable out and resign. His attitude is truly outrageous. The World Bank's board is set to resume discussions over the fate of its embattled president, Paul Wolfowitz. He has been mired in a row over alleged favouritism involving his partner, prompting calls for him to quit. 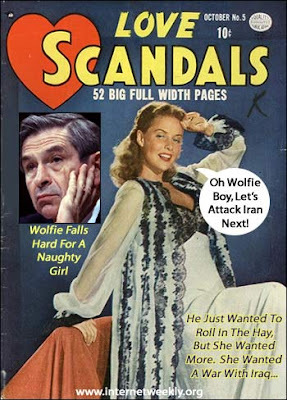 Unconfirmed reports have suggested that Mr Wolfowitz is trying to negotiate terms for his departure. President George W. Bush said he "regretted" the situation had arisen, while saying he believed all those involved had "acted in good faith".